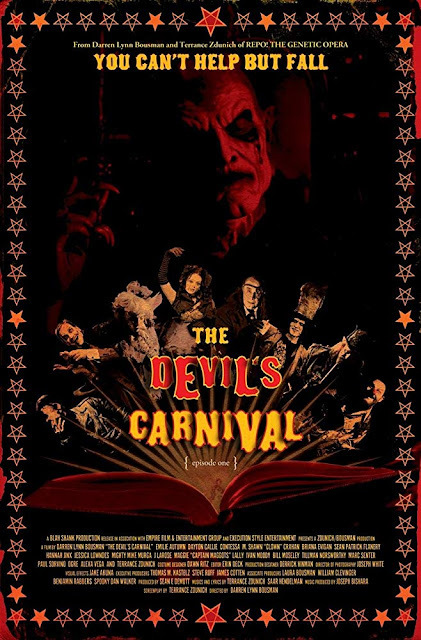 Three people are sent to hell where they face retribution at a twisted carnival run by the devil. A weird carnival that's full of clowns where everyone talk-sings...sure sounds like hell to us! "The Devil's Carnival" is directed by Darren Lynn Bousman, who is best known for directing horror flicks like "Saw II" through "Saw IV." It is written by Terrance Zdunich, who worked with Bousman previously on the horror-musical "Repo! The Genetic Opera." It tells the story of three sinners named John (Sean Patrick Flanery), Tamara (Jessica Lowndes), and Ms. Merrywood (Briana Evigan), who are sent to hell to be punished at the Devi's Carnival, an unusual, macabre circus that deals out ironic punishments through the acting out of an interpretation of Aesop's Fables. In this nightmarish place, they will meet Lucifer (Terrance Zdunich) and his sadistic carnies Ticket-Keeper (Dayton Callie), The Painted Doll (Emilie Autumn), The Twin (Nivek Ogre), Hobo Clown (Ivan L. Moody), and The Scorpion (Marc Senter), who will exploit each newcomer's vices and lead them to their ultimate fate. Since most of "The Devil's Carnival" is told through song, we couldn't help but think we might have enjoyed the whole thing more if we had been able to understand the lyrics the actors were singing because much of the singing is actually just talking on rhythm to the music. When big groups of people sing together, the characters talk over each other and do so slightly out of unison, making it sound more like noisy chatter than singing. This twisted style of music may be intentional to create an unnerving feeling in hell, but it came off as calamitous to us. People who are fans of Bousman's and Zdunich's previous collaboration "Repo! The Genetic Opera" may enjoy this type of presentation and musical style, but for us, despite enjoying their previous offering, this film never quite clicked with us. The movie is not a total loss as there are still some enjoyable aspects, including some creative horror makeup work, impressive set designs, and unique characters. Bousman manages to do a lot with a relatively modest budget, and apart from some awful CGI, the film looks quite impressive. Still, it can't escape its off-off-Broadway stage play vibe that has always been ever-present in Zdunich's work. This may work for some, but it didn't work for us. We were really excited to watch the highly recommended "The Devil's Carnival," but we were left pretty let down from we expected to be some macabre musical fun. At least this film is short, so even if you hate it, you only suffer less than an hour from start to finish.